The choir performs without referring to words and music and many of the members do not read music. Consequently, learning new pieces can take some time. Regular attendance at rehearsals is a fundamental part of the learning process. Some believe that equally regular attendance at local drinking establishments following choir practice is also important. These group activities are (or should be) supplemented by private practice with the aid of tracks which the members can listen too and/or download from the website. The library of tracks is being developed to facilitate the progress of new members of the choir to full concert performance fitness. 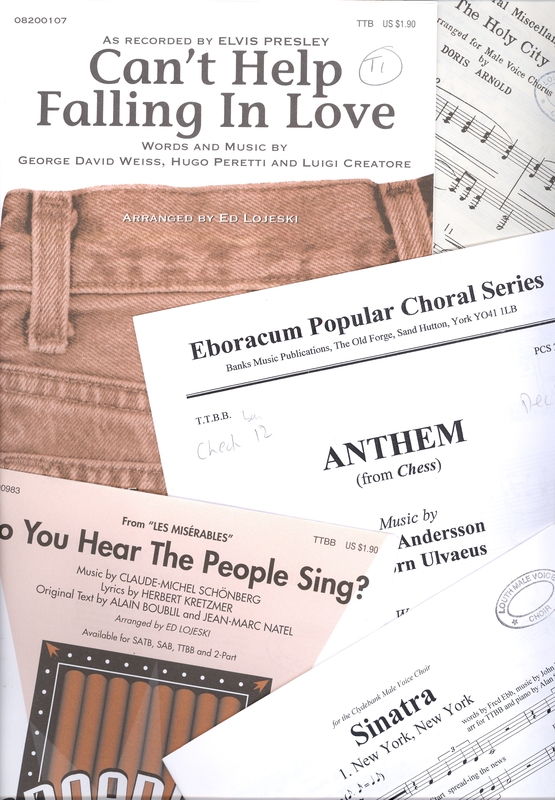 There is a back catalogue of over 160 tracks in all four parts that are put into the Learning Aids section as they come back into the repertoire. Morte Christe – “When I Survey the Wondrous Cross” by Emrys Jones is the invariable finale to the choir’s concerts and has been performed at the funerals of choir members . Londonderry Air (Danny Boy) – Does anyone not know this Irish Folksong? Arr. Gwyn Arch. Lily Of The Valley – A beautiful a capella American spiritual song. Homeless – African folk song included in Paul Simon’s Graceland collection, arr. Allan King. (B2 Intro solo parts, currently by Malcolm Kerridge). African Trilogy – two traditional songs Siyahamba and Shosholoza and the National Anthem of South Africa (T1 solo currently by Malcolm McClean) arr. Gwyn Arch. Rain, Rain Beautiful Rain – By Joseph Shabalala of Ladysmith Black Mambazo. A shorter piece in the same genre as Homeless. 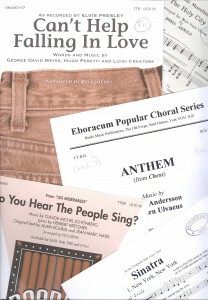 We sing these back to back with sound effects which always gets a startled reaction from the audience. The wind Beneath My Wings – Bette Midler’s best-selling single for which she received two Grammy awards. She also stared in the film of the same name. Jeff Silbar & Larry Henley, arr. Gwyn Arch. The Lord Is My Shepherd – Psalm 23 by Franz Schubert (Not the Vicar of Dibley one!) arr. A. J. Foxwell. One of the choirs favourite and sung in memory of two recently deceased members, Frank Meechan and Russ Harrison. You Raise Me Up – Sung by various groups, the most popular being by Westlife. By Rolf Løvland and the lyrics by Brendan Graham arr. Alan Simmons. Portrait Of My Love – Remember Matt Monro of the 60’s & 70’s. This arrangement is by Alan Simmons. Back Top The 60’s – Seven classics ‘The House Of The Rising Son’, ‘Sealed With A Kiss’, ‘He Ain’t Heavy’, ‘Pretty Flamingo’, ‘Silence Is Golden’, ‘How Do You Do It’, ‘Da Do Ron Ron’. This didn’t take much learning arr. Alan Simmons. Cavalry Of The Steppes , Cossack Patrol – This iconic Russian song is wonderful to sing, words by Billy Scott, arr. L. Knipper. Amen (incorporating “This little Light of Mine”) – Traditional American spirituals arr. Alan Simmons. Every Time I Feel The Spirit – Traditional American spirituals arr. Alan Simmons. Goin’ Home – From the Largo of the symphony ” From the New World” Op. 95 Anton Dvorak. Words and adaption by William Arms Fisher. Remember the Hovis advert? Nessun Dorma – From Tourandot by Puccini, arr. Alan Simmons. Now don’t tell me you haven’t heard Pavarotti singing it.